Let's enjoy the sunset on Mount Lycabettus! it doesn't matter if you've been on this hill before or not, this time you will love it! I'm inviting you to enjoy this spectacular view with me on sunset. Lycabettus hill or mount is the highest point in Athens, rising Protected content Protected content above the city. and climb it up, slowly so everybody can keep up. Don't worry if you're not in shape - neither am I :). 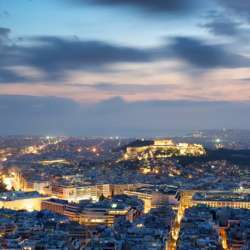 On the top of Lycabettus we will enjoy an amazing panoramic view of Athens, including the Acropolis and even the sea. I recommend you bringing your cameras, I will bring mine for the group shots and of course the view and the sunset at 17:30. We will also see St. George (Agios Georgios) church on the top, a stunning white church which was built in the 19th century. After this if you like we can relax and have a drink or desert at the restaurant (I will call to make sure they're open). if it will rain we'll reschedule for next day (Sunday). Keep in mind I'm not a tour guide, I will tell you couple of things I know :) you're more than welcome to share your knowledge with the group. 3. I think we'll skip the restaurant on the top.